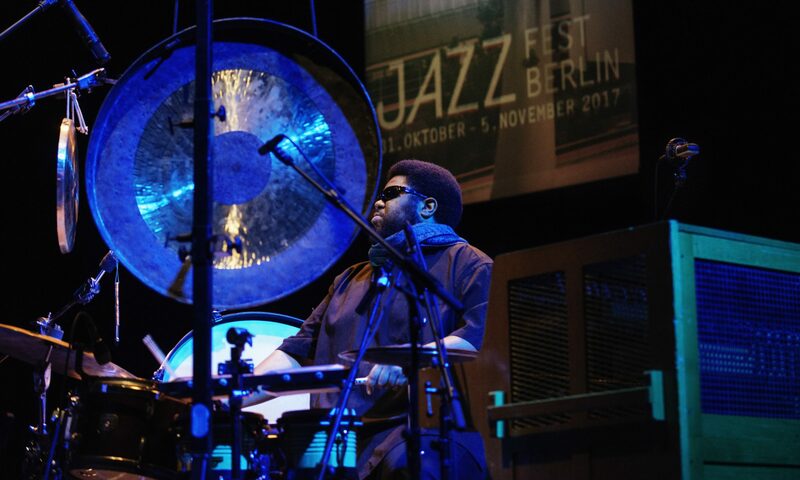 Franziska: Tyshawn Sorey, how much manpower is needed to transport your percussion setup from A to B? 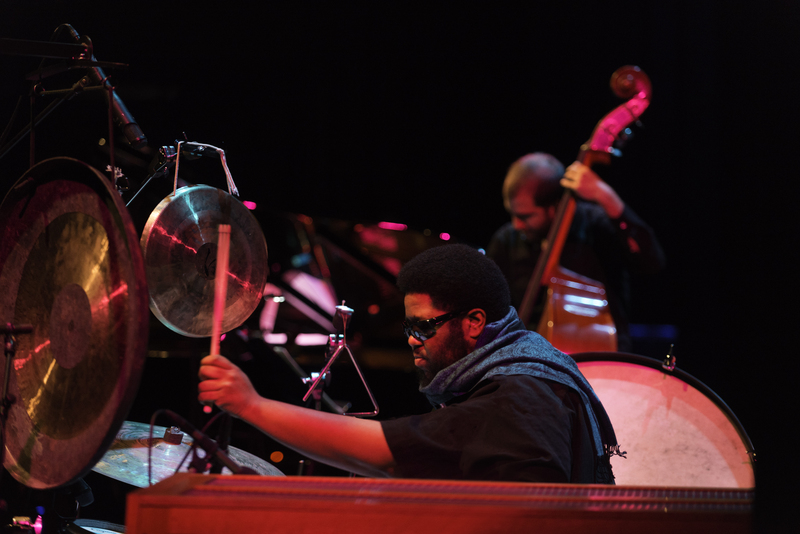 Tyshawn Sorey: It takes a very long time to transport it and then about two hours to set everything up. I typically try to have three or four people to assist me in getting the setup out of a big truck and everything that I would rent. It is not only percussion instruments, there is the celeste, there could be a synthesizer or a trombone which I also been playing for a long time, there could be a piano. 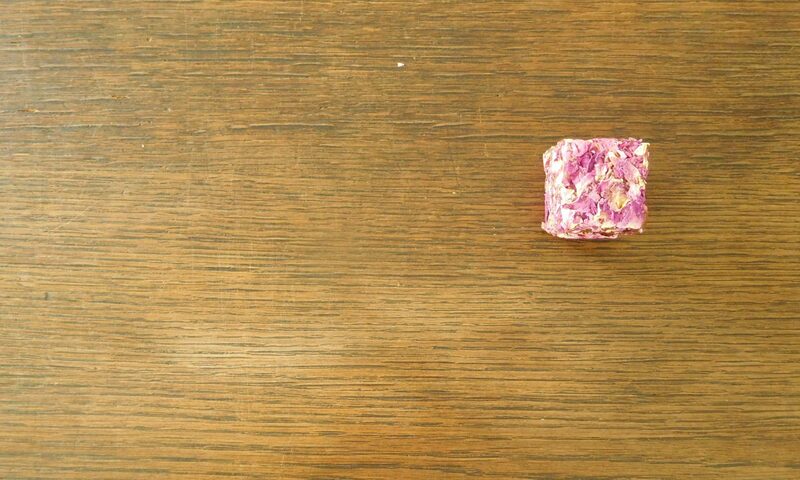 And there are a lot of found objects, things you would find on the street, like kids toys, glas or plastic bottles, a plastic hose. The goal is to be able to create as much sound as I can so that I can deal with as many different sound worlds as I want. Technically I would call it a multi-instrumental setup. How many continents are represented in your setup? There is a variety of Tibetan instruments such as la-gna [Tibetan frame drum], gongs and things like that. So there is a lot of Eastern, or Asian percussion as well as Western type stuff. There could be a kalimba, I’m looking to include a balafon as part of my setup because I love that music and it’s something that I hope to tap into more often someday. Also Japanese taiko drums are something I would like to usually add to my setup. What could someone guess about the music when only looking at the percussion setup? That there is a wide variety of sound that could come out of the setup. There are some times where I barely play the drumset at all even though sitting there. I would not necessarily expect anything out of the setup other that there is a wide variety of sounds you can listen to. There is a lot of sound and motion, too. It unfolds very slowly, I try to represent that in my movement. It is quite a workout. How many years did it take you to develop your setup how it is now or would you say it is a living organism? It is a living organism. I have spent maybe two years developing it and actually being able to get the equipment that I need. For a long time I have dreamed of having a setup like this for my work but I never had the money to get it and I never had the funding to pursue getting it. But then, since I have applied for scholarships and grants I have created music that would force me to make me get such a setup. That is what I did – I created a context for myself in which that would work. A lot of it has to do with my studying of contemporary classical music traditions and my fascination with that sound world and I have played a lot of pieces that are in that medium. 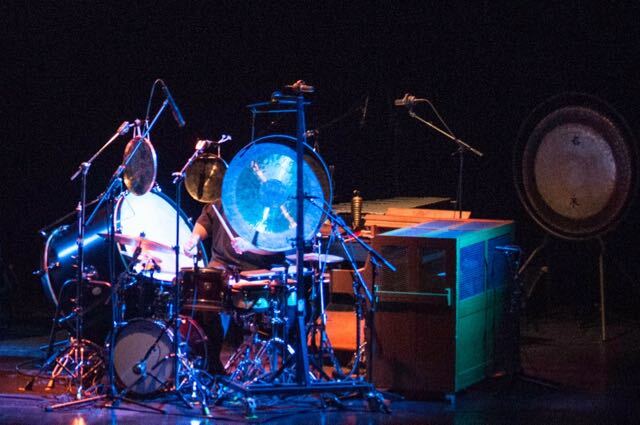 The big concert bass drum is one of the most important instruments in my setup because it is a sound world that I could never get out of a regular sort of drumkit. I find the drumset can be limiting. Similar to when the term jazz is used relating to your work? I never use the word jazz at all, I never acknowledge it in my work. Because jazz sort of dictates where I am supposed to function in terms of what I am doing as an African American drummer, whatever which I do not buy. And my music is not really jazz at all in terms of what the common definition of it is. Frankly I think it is kind of a disrespectful word to describe my music. Just because it is improvisation in the music does not mean that it is jazz. That is the thing that some people can not understand. In the States I was called a jazz composer, I wrote a ,jazz score’ even though a new music ensemble performed it, I play ,jazz drums‘ even though there is a large percussion setup and I am playing a piece that integrates 20th century classical music and African American improvised music. I ran into that problem many times in the States but not as much over here. I think that is interesting. I have wondered if you have some marching band experience. Yes, I was recruited into a marching band during my junior high school years. I was younger than most of the high school students. I got recommended to participate so I had a lot of marching band activity. I have been long inspired by marching band music and the music that came out of that tradition. At least in my experience in African American marching bands and universities in historically black colleges usually the repertoire in those groups is popular songs that exist from the day and also a lot of this pop music that is rearranged for marching bands to play. Sometimes they would add sections that feature snare drums, or add sections for quads or any instrument in the percussion family within a marching band. What about the social meaning of marching bands? I think it is important that we have a medium that is largely regarded as a very colonialist medium that was sort a eurocentric medium. I think African American groups were very inventive in how they took that approach and really made it into something that was also reflective of their experience and of their time. Just as we have done with jazz. Jazz is an African American tradition but the drumset and how it is viewed as sort of a colonial instrument and how a lot of these African American geniuses in the early 20th century took that and invented it as a means of their expression within jazz music. We see the same thing happening in marching bands and how that was all developed, how that is taken down and sort of recontextualised to fit our experiences, parallel to what was happening to jazz. Back to the beginning of our talk – do you have a special idea about what you would like to integrate into the living organism of your percussion setup in the future? Cookware. I have been a long time fan of cast-iron pots and pans and stuff because I think they resonate the most out of all of the cookware. One day my hope is to get the set of cookware that I have been dreaming of getting, hopefully making that as extensively part of my setup as possible. I like to buy my own and use it exclusively for performances.